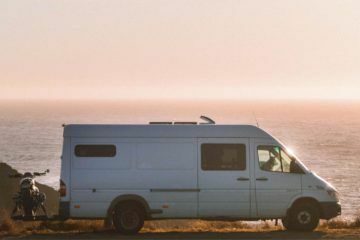 As most of you know, Tom and I are gearing up towards van life which is why we thought it would be fun to kick things off by interviewing fellow van-lifers…. (is that even a word?) 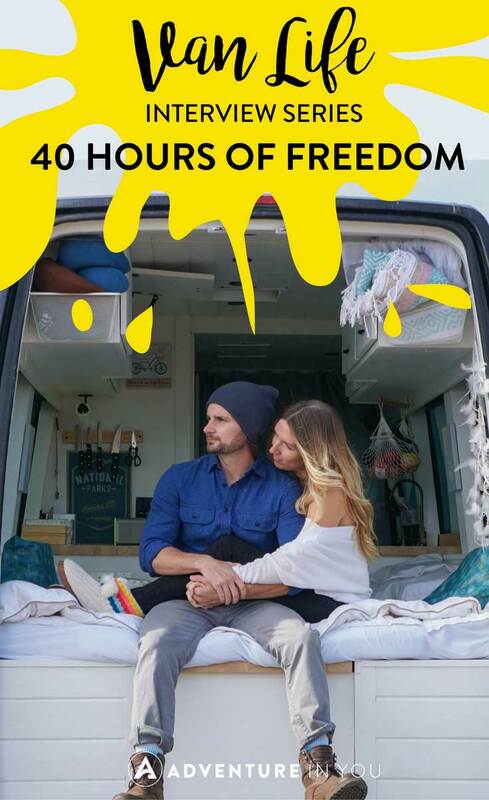 With that in mind, I am pleased to introduce to you the guys behind 40 Hours of Freedom, owners of a gorgeous van which I constantly drool over when browsing Instagram. 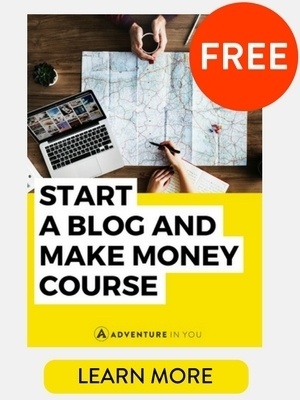 I reached out to them over email as I wanted to know the ins and outs of van life, getting down to the nitty-gritty of how much van life really costs, what are the rough expenses on a day to day basis, and what not! If you’re interested in van life or are just dreaming about it on a daily basis like we do, watch out for this space as we want to fill it up with as many amazing interviews and guides over the course of the year. How long did it take you to convert your van? What was the hardest part? It took 3 months working on the van full time to convert it. The hardest part was figuring out how to build everything since the van is not level and everything has weird rounded corners and edges. 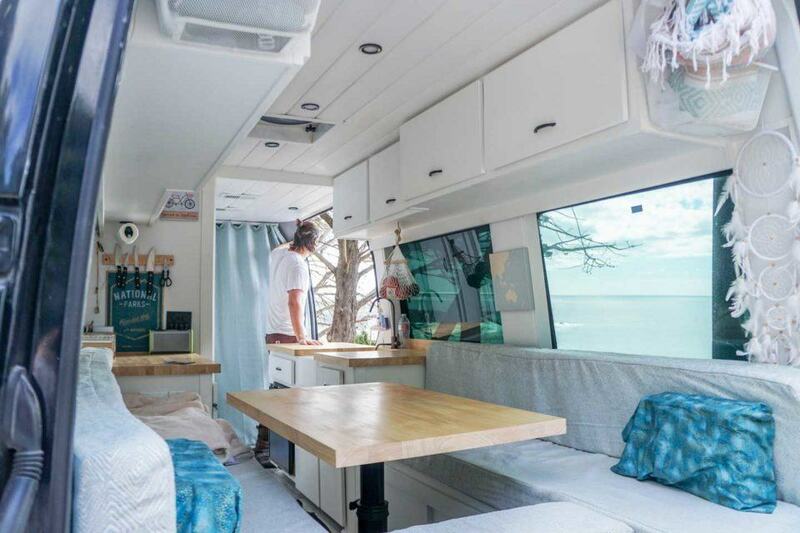 Total Cost of van renovation? We bought a 2008 Dodge Sprinter that had only 55,000 miles on it for $25k. The conversion cost us about $15k just for the materials. Most people think building a van is cheap, but we didn’t want to skimp on the things that were most important to us (having a bathroom, nice sink, solar/batteries, etc). We were lucky to have the help of Sara’s dad who was a professional home builder for over 40 years. Without him, we would’ve needed to hire help, so if you don’t have an expert on hand you’re going to end up spending more on the conversion to hire some experts. Where are you currently traveling around? Any favorite places so far? We are currently in Southern California for the holidays to visit with Sara’s family. We’ve absolutely loved going to Banff, Jasper and the Washington and Oregon coast. 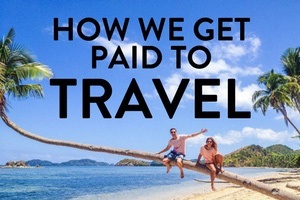 What do you do to fund your travels? We have a business teaching others how to build their own brand and business online leveraging social media and affiliate marketing. 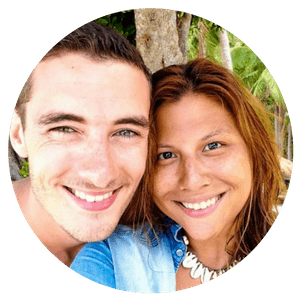 Being able to work and travel full time together has brought us closer together while still allowing us to be productive and grow our online business. That's why we opted for a convertible table/bed. It only takes a few minutes to go from bed mode to work mode or vice versa. Often when we are driving long distance on the daily we will stay in "bed mode". This allows for easy nap breaks and puppy snuggles. Today we opted to take our office to the beach so that we can work and enjoy that fresh California air. ??? What are your average monthly expenses living in the van? $1500-2000 depending on how much we are traveling and eating out or checking out local activities. 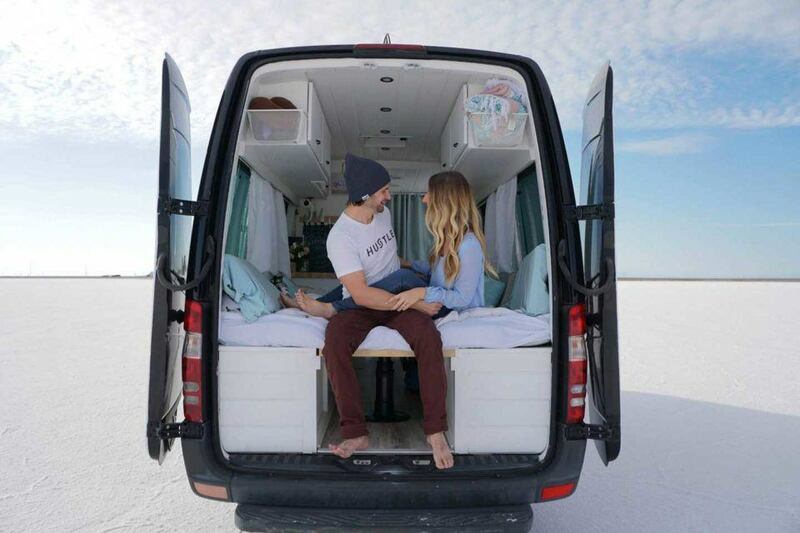 If there was one thing you could change about your van, what would it be? Making our countertops a little less deep. Our walkway is a little tight between our countertops and our bathroom, so next time we would make that a little bit wider by decreasing the depth of the countertop. What’s the one item in your van that you can’t live without? Our fantastic vent fan! That thing is great for ventilation and keeping the van cool during the day/night. Biggest Tip for those thinking of doing van life? Expect the unexpected during your build. It will take longer and cost more than you think! Also, expect nothing and experience everything. 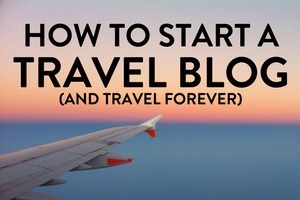 Being on the road is so much fun, but it can become stressful if you try to plan too much. Just enjoy every day and moment for what it is. It’s such an incredible journey that will only happen once in a lifetime! Awesome! I hope you guys enjoyed reading that as much as I did. Now if you’re like me and you’re always on the lookout for van lifers to stalk, here are the social media details of Sara and Alex. Feel free to follow them on Instagram or their Facebook page.